The catch-up tour continues as I discuss a few more albums that came out near the end of 2010. You may already have these, but if you don't, then you should. And by these I mean each of the "last year's albums" I have reviewed this year. 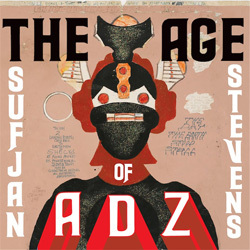 Specifically, Sufjan Stevens' massive 2010 effort that summed up in one extended play, All Delighted People, and one full-length album, The Age of Adz. In traditional Stevens form, the EP is still solid, coming in at just under 60 minutes. Most albums aren't that long, but hey, Sufjan is a prolific composer, perhaps one of the greatest in our time, so even when he does a "short" project, it ends up being as long as three combined Weezer albums (etc.). The trick is that since 2005's Illinois, Stevens hasn't found the same lusty audience for his other work, an assemblage of thematic projects including Songs For Christmas and The BQE, and his work with other groups. So, last year we received two solid projects, both of which demonstrate a musical pseudo-transformation for Stevens. With All Delighted People and The Age of Adz, Stevens composes music with more electronic influence, but remains entirely recognizable. These two albums are essentially the Mechagodzilla to Stevens' usual Godzilla. You know who it is, and it feels right, but it's also not quite the same. 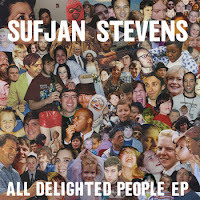 With All Delight People, Stevens brings two versions of the title track, one "original" and one "classic rock". It is a solid and complex song in each iteration. And the tracks that fill in around it vary from melancholy to upbeat melancholy. Songs like "From The Mouth Of Gabriel" and "The Owl And The Tanager" uphold beauty over all else, the latter of the two relying on a healthy dose of synthetic sounds and clunky beats to motivate it. The real gem of the disc lies in "Enchanting Ghost," a song that combines everything we've come to love of Stevens, the earnest lyrics, the calm guitar and banjo, and just a touch of electric guitar that really pops. It's a tragic breakup ballad, driven by that sense I think we all get that when we lose someone, in any capacity, but with love specifically, that they continue to exist in some theoretical way. The life you dream them living that you will never see. Or at least, we would never have seen without the proliferation of social networking, but that's another issue altogether. There's also a piece of magic success in the final track "Djohariah," named for Stevens' sister (according to the internet). It's a sprawling classic rock masterpiece, clocking just over 17 minutes. Parts of it feel like the extended outro of "Hey Jude," but with greater self-awareness and FAR better instrumentation. The trick of All Delighted People is that it serves both as an appetizer for The Age of Adz and as a clear statement by Stevens that he's still writing, still exceptional and still full of love that translates into music beautifully. The Age of Adz takes my whole Mechagodzilla analogy up a notch, simply by dialing up the electronics and drawing back the elaborate instrumentation. Even though the opener, "Futile Devices," feels like a pretty standard track in the Stevens canon, it works mostly as a quiet usher for what's to come. Even the refrain "Words are futile devices" seems to proclaim that where Sufjan has been a poetic, acoustic operator before, he will be changing things... IMMEDIATELY. And that's what happens with the excellent "Too Much," a song with beautiful vocal harmonies (as is expected) and repeating looped samples that crunch and bounce, throwing you into space, or the future. Really, The Age of Adz fights for elegance and traditional musical styles amidst the din of mechanization. It's a beautiful allegory in itself, combining the orchestral touches that were part of Stevens' initial popularity, with scratchy laser noise (pew-pew, etc.). Fantastically, the album just keeps getting bigger. "Age of Adz" brings quiet moments and perfect, wailing, earnest lyrics in tandem with huge electronic beats, walls of sound, and brass, with sleigh bells. Every flavor starts to appear, and remarkably, Stevens excels with EVERY try. It's a unique and amazing thing when an artist reaches out to a new fan base so ardently, and it's incredible when he succeeds. "I Walked" holds the sweet narrative structure that was so typical of Illinois and Michigan, combining sad with hope to great effect, and hell, great affect. 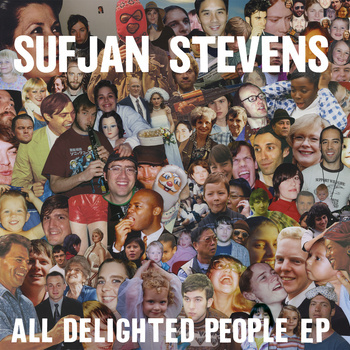 I think that's why I love Sufjan Stevens' work so ardently. Listening to it hurts sometimes, it wells tears in my eyes, and other times it invigorates, but I always feel something. This music throws me into a memory and a dream and makes me wish and love and hope. Even when it is tragic, the value lies in that passion. And that's clear in "Now That I'm Older," a sweeping, wailing, track about love and growing up/old. But with The Age of Adz you also get (imagine an infomercial voice for this sentence, if you please) a taste of Sufjan pseudo-hip-hop. Aside from all those hyphens, "Get Real Get Right" gets electronics, funky lyrics, marches, powerful drums, and speedy near-rapping. This song may be the best thing to happen to an album in a long time. It's so full, so lush. The entire album supplies this kind of ornate, complex music, so true fans will love it no matter what, and fans of the "hits" on Illinois will need a little time with it, but, well, wow. The closer "Impossible Soul" runs an amazing 25 and a half minutes, touching electronics, horns, strings and so much more. It's all love. Enjoy it. And pick both of these up. Forever.